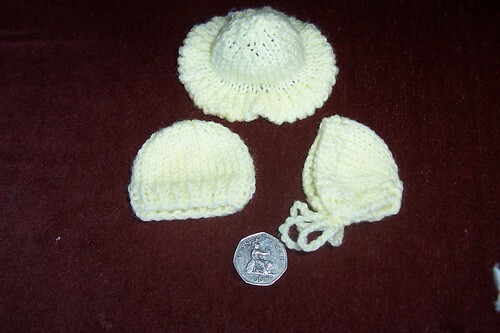 Very, very small hats « T-Bird\’s crafty Blog! There was a request for some hats or bonnets small enough to fit a golf ball sized head. Someone found a pretty nice crochet pattern but there wasn’t a knitting pattern available. Well, it didn’t take long to crochet a hat up and work out a knitting pattern from it! Work 8 more rows plain. [ dec 1] around next 2 rounds, break yarn and thread through stitches, pull snug and finish off. Work next 12 rows plain then follow crown shaping as for hat. fold brim under at “picot” row and slip stitch loosely in place. Cast on 32 sts on a straight needle, this is not worked in the round. Work as for basic hat directions but add a narrow moss stitch boarder at each edge until you begin shaping for crown. Make crochet chains or cut narrow ribbon and fix on for ties. This entry was written by tbird and posted on 15 January , 2007 at 9:44 pm and filed under Free Patterns, SCBU items. Bookmark the permalink. Follow any comments here with the RSS feed for this post. Post a comment or leave a trackback: Trackback URL.